Figures for the rate of hospital infections caused by the superbug MRSA have been published for every NHS trust in England. They show wide variations across the country. 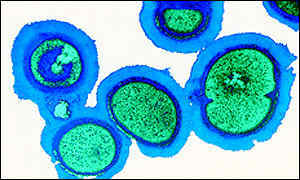 MRSA is a form of the Staphylococcus bacterium that is resistant to the commonly used antibiotic methicillin. There have been cases of the bug showing resistance even to vancomycin, an antibiotic traditionally regarded as "the last line of defence". While not dangerous, and often symptom less in more healthy patients, in the elderly, weak or immuno-suppressed, MRSA can cause fever and pneumonia. The research has been carried out by the Public Health Laboratory Service (PHLS). It found that the number of cases of MRSA bloodstream infection in acute trusts ranges from 0 to 0.69 cases per 1,000 days spent by patients in hospital. The highest in the country was University Hospital Birmingham NHS Trust with 0.69. The lowest included the Liverpool Woman's NHS Hospital Trust. London's Great Ormond Street had a rate of just 0.05. Single speciality hospital trusts generally have lower rates of infection than general acute and specialist Trusts. This is because treatment may involve less invasive procedures giving rise to a lower risk of infection. The research also found that trusts in a particular region of the country tend to have similar rates. The highest rate was found in the London region, and the lowest in the North West. Since April 2001, every acute NHS trust in England has been required to report all cases of blood poisoning caused by MRSA. The new data looks at cases reported in the first six months of this new scheme. Health Minister Lord Hunt said: "Hospital infections caused by MRSA are recognised as a problem in most parts of the world not just in the NHS. "We believe that patients have the right to know the rate of infection in their NHS Trust which is why we have published this report. "Higher rates of infection do not necessarily indicate an infection control problem in a hospital this could be due to a higher numbers of vulnerable patients and the number and type of invasive and high-risk procedures that may be carried out. "Equally low rates are not a reason for complacency, standards of infection control must be maintained." Sheila Morgan, Chair of the Infection Control Nurses Association said the report was an important initial step in determining the level of serious MRSA infections within acute NHS trusts. She said: "Although in its infancy, the data provides useful initial comparative data for infection control personnel to assess and evaluate local, regional and national trends." Around 100,000 patients a year pick up infections in hospitals. It is thought that about 15% of these are preventable, saving patients' suffering and the NHS an estimated �150m a year.